This article is about the obstacle in Pikmin 3. For the treasure, see Crystal King. Suggestions: Double-check all lists to see if any location is missing. The first crystal found in Pikmin 3, in the Distant Tundra. Crystals are obstacles that appear in Pikmin 3 and Hey! Pikmin. Although there are several objects made of crystal-like materials in the game, the standard crystal obstacle is a see-through rock. Crystals can contain objects inside, like fragments, pellets, and also fruits, but their main purpose is to serve as blockades. Despite there being different types of crystal-related objects, all of them need Rock Pikmin or bomb-rocks to be broken – other Pikmin types will just tap away, only to give up after a bit. Three gray pellets inside a large crystal. In Pikmin 3, large crystals are relatively big crystals. This the most common type of crystal; it appears in every area, except the Tropical Wilds. By throwing 10 Rock Pikmin at them, they will break. They can contain fruit, fragments, data files, and even blobs of ultra-spicy spray in Mission Mode. In addition, the Rock Onion is found in a large crystal. There are 3 large crystals in the cave with the Rock Pikmin. One holds a data file, another holds some pellets, and the final holds the Rock Pikmin's Onion. One large crystal is near the red bridge and holds the remaining 20 fragments to the bridge. There are two crystals before both the Armored Mawdad and Quaggled Mireclops, each containing 20 fragments for their respective blue bridges. A large crystal can be found near the Burgeoning Spiderwort in the second half of the area, and it holds a Searing Acidshock. A large crystal is present in the room where the Yellow Onion is discovered and contains a Disguised Delicacy. Two large crystals are found in the area with the 2 Joustmites and the flower pot. Both are used to create paths to and from the fragments to avoid the Joustmites. The Zest Bomb is encased in a large crystal, and is guarded by an Arctic Cannon Larva on a high ledge. A large crystal is located near the Fiery Blowhog, and holds a data file. There is a large crystal in the area where Charlie crashed. It simply acts as a roadblock so Charlie cannot escape that area, and must be broken if the player wants to take anything in that area back to the Drake. A pile of 20 fragments is encased in a large crystal, near an electric gate. The Dapper Blob is found across a small pond with a Yellow Wollywog in it. It also is encased in a large crystal. The Blonde Impostor is found in a large crystal on a high area accessible via Bouncy Mushroom. A large crystal blocks off a small area with a pile of 30 red fragments, causing the Pikmin to go around. Another large crystal blocks off the path to the area with the reinforced wall. In Hey! Pikmin, large crystals are the most common type of crystals, and can block paths, fall on the player or serve as a slide for Olimar and his Pikmin. Two Pikmin in front of a small crystal, which blocks a geyser. Small crystals are crystals that only need 3 hits from a Rock Pikmin to break. These crystals don't contain major objects, usually just pellets, but they can block geysers. Particularly: Add the list of small crystals in every area. There is a small crystal in the cave where the Rock Pikmin are found, and it contains a gray pellet. There is a small crystal near two Crimson Candypop Buds and two Pyroclasmic Slooches. It blocks a geyser. There are two small crystals which block a geyser near the two Arctic Cannon Larvae. There are five small crystals in front of three Desiccated Skitter Leaves. They are the first small crystals found in the Story mode. Three of them contain a pellet: one red, another gray, and the final yellow. 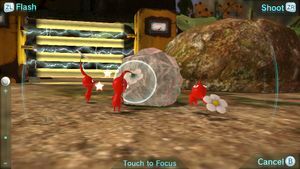 Three Red Pikmin trying to break a crystal nodule in Pikmin 3. Crystal nodules aren't like other crystals: they don't block paths, contains objects or block geysers, but are the main weapon of Skutterchucks. Crystal nodules are very small, white crystals, and only need one single hit from a Rock Pikmin to break. In Pikmin 3, these objects are thrown by Skutterchucks, while in Hey! Pikmin, they are dropped. In Hey! Pikmin, they also aren't found lying around, and are rather obtained when Skutterchucks walk through certain crystals. Tropical Wilds:There are 4 crystal nodules alongside two Skutterchucks, next to the two areas where the Shaggy Long Legs is found. Garden of Hope: There are 5 crystal nodules near the two Skutterchucks in front of the red bridge that connects the S.S. Drake and the area where Brittany is found. Formidable Oak: There are 6 crystal nodules near the two Skutterchucks in the part where the Nectarous Dandelfly is found. Springpetal Cave: This is the only area that they are found in in Hey! Pikmin. They are obtained and dropped by several pairs of Skutterchucks that walk around platforms. In Hey! Pikmin, icicle-like crystals are crystals that look like icicles. When Olimar and/or his Pikmin approach one of those, the crystal will fall on them, killing or harming the crew. In order to avoid this, the player must trick the crystal into falling and then getting out of its way. The crystal on the Quaggled Mireclops is referred to as a "Mireclops Crystal" specifically and needs 40 hits from thrown Rock Pikmin to take down. Crystal walls block the way with a crystalline wall. While not given any specific names, the Peckish Aristocrab's claw as well as the shells covering the bodies of the Calcified Crushblat, the Armored Mawdad and the Crystalline Crushblat are all made of a crystal-like material. Finally, the Plasm Wraith can spit out an Elemental Plasm that transforms into a huge crystal cube, which must be broken down bit by bit until it collapses into a pool of plasm. The Rock Onion and a data file in large crystals. Alph throwing Rock Pikmin at a large crystal, which contains 20 fragments. Three crystal nodules with a dead Skutterchuck. Alph breaking a crystal nodule with a Rock Pikmin. A drop of ultra-spicy spray in a large crystal, in Clockwork Chasm. A large crystal holding a Golden Sunseed in an early version of the game. A geyser blocked by a crystal. An icicle-like crystal in The Shallow End. Several large crystals in Crystal Tunnels. In the E3 2012 demo of Pikmin 3, all crystals were referred to as crystal nodules. In addition, large crystals back then were translucent, while the ones in the final version are roughly opaque. In the Silver Lake Remix, there are two abnormally big large crystals – their size is due to them storing 50 nuggets, which would be too much for a "normal" large crystal. However, it still takes 10 hits from a Rock Pikmin to break, regardless of size. In the Battle enemies! 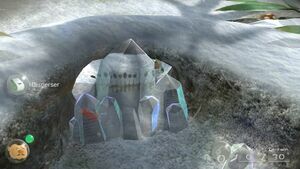 version of Twilight Hollow, a large crystal blocks a geyser; this is the only large crystal in the game to do this, which normally, only small crystals do. One of the two large crystals that contain 50 fragments. A large crystal blocking a geyser. This page was last edited on April 16, 2019, at 19:28.